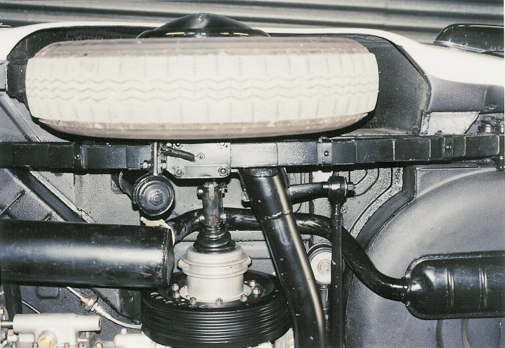 The rear suspension on the de Dion cars is attached to the body via rear leaf springs. These are mounted to the body at their end shackles by welds, with both some plug welds and a bead weld. Their general location is noted above (in red) although the left one is just off the picture. Over time, these weld points may weaken. Ed Godshalk found this out with his 4th series B20 in Oregon. His car was in good shape, with a rebuilt motor and crisp mechanicals. He had used it quite a lot over the years. But a few weeks ago, his rear leaf spring mount let go and the car spun out of control. Off the road, into the ditch, down the hill, and upside down. Ed and his passenger got out safely, luckily, although with some difficulty. After hearing this I went and checked our B24, which had been restored by Bob Williams in Pittsburgh. Hats off to Bob – the rear mounts were reinforced and heavily welded. So too was the front axle, where it mounts to body. Ed has written up his accident, in the attached PDF file (click on photo below). Sad but true. WARNING – check the welds!